OLIVIA KIERDAL turns twenty one on January 12. 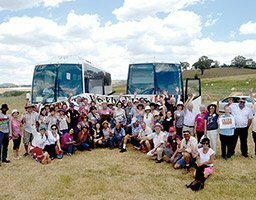 The talented Olivia was TWT Granny Smith Festival Queen in 2013. 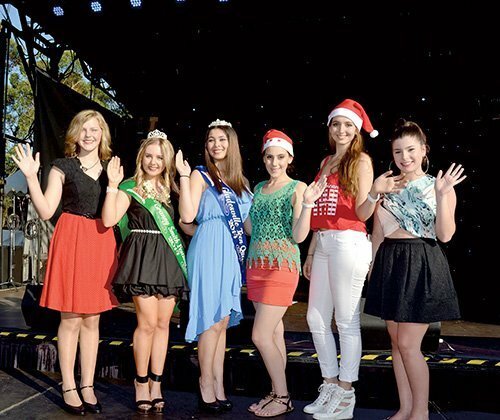 She is pictured second from right wishing everyone a Merry Christmas and Happy New Year along with some of our very talented quest winners, l to r, TWT Gladesville Singing Star Clare London, TWT 2014 Granny Smith Festival Queen Isabella Laguzza, TWT 2014 Gladesville Festival Teen Queen Samantha Bowyer-Tagg, TWT 2013 Teen Queen Johanna Sciancalepore and Singing Star Kate Jenkins. TWT on-the-spot PHOTO. and Happy New Year 2016!